Lush-Mad Love-Twenty Years On ! In our 2008 interview Miki also spoke about the capricious nature of the press thus “I remember the Melody Maker reviewing ‘Split’ and slagging us off because (apparently) all our songs were light, jangly things about fluffy clouds and fairies. Meanwhile, reviewing the same album, the NME complained that our lyrics were too depressing (covering child abuse and parental death) and didn’t fit the sparkly, light melodies. I guess what I’m saying is that we couldn’t do right for doing wrong.” Personally I’d always put this sort of fickle wankery down to the arsey hipster fellating London based music press, who combined old school misogyny and indie elitism with a good old fashioned “build ‘em up then knock em down” sensibility much loved by our more unsavoury tabloid newspapers. I suppose the problem with journalists perpetuating unwarranted myths is that people start to believe in them, indeed myths that are believed tend to become accepted as truths. And whilst I don’t subscribe to Alan McGee’s view that My Bloody Valentine were a joke band, or that he used them as a piece of McLaren style situationalism to see just how far he could push hype, the fact remains that MBV’s legacy has been hugely overblown in much the same way that Lush’s musical contribution has been seriously underplayed. And that I’m afraid is down to the press. 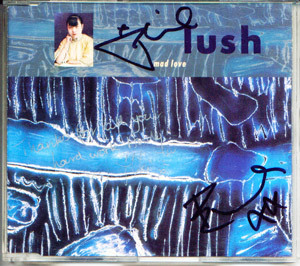 It’s been 20 years since Lush released their Robin Guthrie produced ‘Mad Love’ EP and so maybe it’s time to re-evaluate Lush’s musical legacy. Let’s just hope any such re-appraisal won’t be peppered with tiresome elitist blather about Brit-pop or accusations of ‘selling out’ , a charge often levelled at the bands final album, ‘Lovelife’. As Miki said when discussing the album – “Is ‘Ladykillers’ more commercial than ‘Hypocrite?’ Is ‘Desire Lines’ more shadowy than ‘Last Night?’ Is ‘I’ve Been Here Before’ a throwaway exercise in jazz lite whereas ‘Lit Up’ is a trawl through the underbelly of discordance rivalling the darkest periods of Miles Davis? 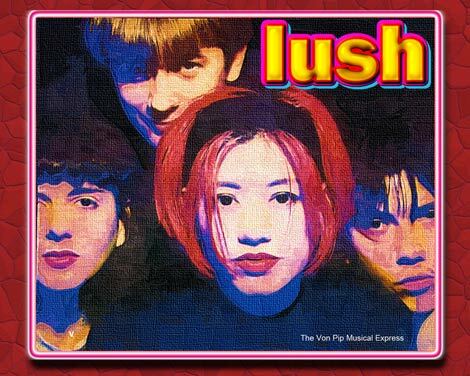 The Quietus website has recently put forward a convincing case for Lush’s legacy to be given the credit it deserves and hopefully this may signal that people are finally coming around to the view, that actually Lush were rather f**king brilliant. And so with 2010, being ‘Mad Love’s’ anniversary we spoke to Emma, Miki and Steve about their memories surrounding the recording of the EP and asked the question many Lush fans have been desperate to put to them. . . what about a reunion? VP: What do you recall about the period of time when you recorded ‘Mad Love’, was it an exciting time, full of wide-eyed optimism ? EMMA: It was really enjoyable and a very easy session. We recorded it in The Church which was Dave Stewart’s studio and it was mixed at September Sound which was The Cocteau Twins’ one. Unlike when we did ‘Spooky’ with Robin, we completed it all quite quickly and without too much tinkering and, yes, things did seem to be going very well at that time. STEVE: It was fun being a proper musician, but I think I’d read enough about the music biz not to be starry-eyed about it. Recording sessions were fun to begin with, learning how a real studio worked etc. Doing our first European tour in Jan-Feb 1990 was great, travelling around Holland, France & Germany and meeting all these foreigners who’d actually heard of us was a hoot. It was the closest I’ve come to being on holiday for a living. VP: Did you enjoy working with Robin ? … How did he come to be involved? EMMA: I had actually met Robin prior to our involvement with 4AD. I had worked for Jeff Barrett (who now runs Heavenly) and he knew Robin and told me to send a demo to him, which I did. We met up (with a pregnant Liz) in a pub on the Kilburn High Road and he said he loved the songs. So we asked him to produce ‘Mad Love’. You might think it was obvious as he was on 4AD too then but at the time but the relationship was quite strained between The Cocteau Twins and the label so actually Ivo trod carefully! Working with him on ‘Mad Love’ was pretty straightforward and Robin is a lovely guy with a very dry sense of humour. Unfortunately working on ‘Spooky’ wasn’t so easy but that’s another story! VP: How did you decide which songs would be on the EP ? EMMA: I think they were just the newest ones we had plus we thought ‘Thoughtforms’ should get the Robin Guthrie treatment. We weren’t that prolific but we were very economic with our songs so whenever we had songs to record, we did. MIKI: I think it’s a bit of a shame telling people exactly what a song is about because, if it’s a song they like, they’ve invariably come up with a much better interpretation that is probably relevant to their own lives and therefore makes the song much more meaningful and personal to them. However, I will satisfy your curiosity. BASICALLY I had a really filthy dream about someone who I never ever thought of ‘in that way’ and it freaked me out a bit because I just couldn’t get the dream out of my head and so every time I saw them it would make me shudder at the very thought but it had also made me fall a bit in love (lust) with them because I just couldn’t shake how passionate the dream had been. EMMA: No, I think ‘’Scar’ pretty much displayed that too but in a rawer state. VP: Emma, you filmed two videos for “De-luxe” ….do bands find filming promo videos a rather dreary affair, or was it fun being one of your first ? EMMA: Those 2 were OK – yes the first one in the tree was the first video we had ever done so it was quite exciting. It’s a very indie video but OK all the same. The second one was done for the USA and we really liked making it and the finished result was pretty good. It all depends on the director really and their ideas. The worst video we ever did was the US version of ‘500’ – bad day and BAD video. VP: Steve, Miki told me that during the video shoot for Deluxe you’d had enough of precariously dangling on tree branches and disappeared ….! What are your recollections? STEVE: I don’t remember that at all but it sounds like something I’d do, I was always prone to wandering off by myself and coming back to find people fretting about where I’d been. Usually looking for second-hand record shops, actually, and if I found one I’d be even later getting back. I do remember it was freezing cold doing that video out in the middle of nowhere in Kent in January, but I also remember someone told us it was where the Beatles did their Strawberry Fields Forever promo, so that was exciting for a lifelong Beatle fan like me. VP: Steve, What are your abiding memories of being in Lush, any regrets about leaving when you did ? STEVE: It was great fun, I loved it all really, and I only left because I’d have preferred to be doing my own songs, only nobody was interested in them, and I could see all the things we’d done that were exciting the first time round (making records, videos, radio sessions, touring Europe, Japan & the States etc) were going to get progressively less fun the more often we did them. Especially the amount of times they ended up touring America. So no, I think I left at the right time, although I do think I was probably a bit jealous of them still being in the band around 1995 when I’d started working in a computer firm in Dublin and they seemed to be living it up at the dawn of Britpop. But even if they’d asked me to re-join then I don’t think I would have, as it would’ve involved moving back to London, which I never wanted to do. But I have loads of great memories from that time, and I still think of Miki & Emma as my alternative sisters, even though I haven’t seen them for years (although I’m hoping to next month). VP: You must get tired of answering this but Emma & Miki, you’ve mentioned previously that a Lush reunion was mooted but due to the “c**ntish flakiness” of some parties things didn’t really take off . Although you all have jobs and Emma’s a new mum now, do you think you’d ever consider it again if somebody genuinely made an offer. EMMA: Erm – that was Miki’s quote and not the whole reason we didn’t reform (she was referring to one promoter). The money and offers just weren’t there that year and we couldn’t take the risk of the outlay without making that back and then some. At the time we were thinking about it I had a very stressful full-time job and would have had to do all the rehearsing and playing in my 4-week holiday allowance which I think would have left me as a nervous wreck! If the money was right then, yes, we would do it but I think promoters would have to come to us so we would be in the driving seat. Who knows what may happen in the future but, yes, for the time being a reformation looks unlikely. MIKI: Yes, I’m afraid that the honest answer is not unless we were offered an awful lot of money. I have enough trouble finding the time to answer these questions let alone relearn the entire Lush back catalogue, rehearse with a new drummer and actually schedule time to play the gigs. So if we did it, I would have to stop work, and if I stop work, then how do I pay the bills? To be fair to the c*nty flake, he wasn’t the only one who pissed us about (although he was the only one who deserves to have a resilient object booted up his backside). One agent after another (well, three) promised the world and then had to admit rather shamefacedly that it wasn’t really happening. They scratched their heads, they didn’t understand, but the promoters just weren’t that keen. In the words of Les McQueen, “It’s a sh*t business”. speak for yourself our kid, I never thought otherwise. saw them every time they played manchester from end 1990 onwards and had a blinding time at every gig – including manchester poly in 1991! . chris, you are missed and as for miki, emma, phil and steve thank you and I wish you nothing but the best. After years of depression and mostly being out of touch with music Lush were the band that drew me back in. Brilliant songs, a beautiful sound, I wish I could win the lottery and pay them an obscene amount of money to play in a marquee in the grounds of my lottery winner mansion. The time that Lush was making music – I call “the golden age”. Along with Lush, there was The Jesus & Mary Chain, My Bloody Valentine, Ride – the greatest music ever being made. Today there is an incredible revival of this sound. Young people are looking to these bands as their inspiration to create their own sound. The true mark of an artist is the legacy they leave behind. Lush certainly were a big part in molding that sound. Hey, thanks for compiling these interviews. I’ve been following the Von Pip Lush stuff for a little while, and it makes me happy to know that the remaining band is back on friendly terms — that’s always struck me as the most important thing somehow. As for a reunion, well, I imagine you’d get the most money sloshing around if a whole ‘scene’ was resurrected. Lush get two bites at the cherry: either a Ride/Slowdive/Swervedriver resurgence or an Elastica/Pulp/Whoever resurgence. My hopes would be on the Ride one, because the Mad Love era was my favourite Lush era (just like the Nowhere era was my favourite Ride one), but my tastes and ‘oodles of cash’ don’t seem to go together. But, with Oasis no longer around, and Andy Bell at a loose end, maybe Ride will give it one last hurrah… that’s when Lush should strike! Anyways, I’ve rambled on, but my overall hope is that Emma, Miki and the bass boys keep doing what’s creatively exciting for them, whether or not that means Lush. It’s the way forward, guys! I remember Lush getting rave reviews initially and then, as they do, the press turned on them a bit. They remain one of my fave bands..come back!!!!!! I mean….do i really have to say anything……..they we’re, and still are, absolutely brilliant…….sends shivvers up and down my spine remembering their studio recordings and the onslaught of “sumo, succulent sound”—-and then the LIVE performances: forget it…..i think the press were jealous and jaded and had THEIR heads up their you-know-whats…………i’d pay thousands of bux to see them do an hour and a half again….either that or give my right foot…..jeeze-louise………i’m that smitten. still listen to them occasionally – great stuff. thanks for this fascinating read. Well, if a reunion is all about the money, I would gladly pay a thousand bucks in advance (to give them time to practice) for a front-row seat to that concert. There, I said it. Now everyone repeat it! Wow, I didn’t know Emma was a mum, congratulations ! I think we shall start a fund in aid of Lush for them to come back. This said, a lot of alternatives to the usual recording business thing are coming out. For instance, Kristin Hersh, one of the former Lush label mates, have a website where subscribers like me (she calls them the “strange angels”) pay 20 $ a quarter to help her going on. It would be a good way for Lush to get some idea of the fans support. Sorry, but I can’t help but feel that cheapens the band. I can’t help but feel that Lush were around for 8 years. If you missed that, well thats just the way it is. For bands to come back after such a long time, it needs doing properly. Going cap in hand on this occasion, I don’t think is the way of doing it. this is a great blog I really appreciate your work!